Gamma’s digital wallpaper is UL tested and contains the Early Warning Effect® heat detection system. Our materials meet or exceed the requirements specified in recognized digital wall treatments standards such as the Federal Specification CCC-W-4084, CCFA-101-D, and ASTM- F-793. In addition, custom wallpaper products are formulated and tested under ASTM E-84, NFPA 286 and CAN S102M to comply with all local, state and federal building and fire codes including but not limited to NFPA 101 Life Safety Code and the International Building Code. All it takes is simple care to preserve and protect the beauty and performance of vinyl wallscapes. Typical dirt and stains can be removed by simply wiping with a damp cloth or sponge and mild soap or cleaner. Tougher stains can be tackled with more powerful cleaners. Unlike other wallpaper murals, Gamma’s products are impervious to most chemical solvents that can break down, discolor and deteriorate less durable wallpaper murals. 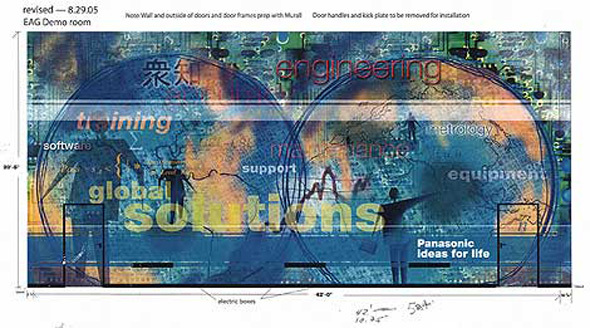 And digital wallscapes feature excellent abrasion resistance (Taber ASTM D793). This directly translates to easier, more cost-effective maintenance and years of top performance. All custom wallpaper is treated with mildew and staph-resistant additives which provide the wallpaper with resistance to the growth of mildew and bacteria and carry a five year warranty against manufacturing defects.